Let’s get the LoveKnitting festive Knit-A-Long started with the first part of the pattern! Read on to find out more, download the pattern and get our top tips. We’re kicking off our Christmas KAL with instructions to knit the back of the baby jumper, to download them, click on the link below. UPDATE 07.11.14 3pm GMT: There was a slight error on the original snowflake chart that we have now updated. To download the NEW version, click on the link above. To download the pattern: click on the download button above and the pattern will open in a separate window. Be patient, it can take some time! If that doesn’t work, right-click instead and select ‘Save link as…’ This will save the pattern as a PDF on your computer, which you can then find and print. If you’ve clicked on the pattern and nothing seems to be happening, your computer may have saved it as a PDF; try looking in your ‘Downloads’ folder. This part of the pattern will take on the stranded snowflakes, which are knitted using the stranding method. Inside your pattern download you will find a knitting chart to follow. If this is your first time following a chart or trying stranded knitting, read our handy guide on how to read a chart. Click here to read the guide. When you work the snowflake chart, you’ll need to join in colour B (white), if you haven’t done this before, don’t worry! It truly is simple. Read this guide for joining on a new ball of yarn. The chart is read from right to left on the right side of the garment and from left to right on the back of the garment. Use a piece of paper or smartphone to write down which line you are on, so that if you need to stop knitting, you’ll know where you need to pick up when you go back to it. When stranding yarns, twist colours every 2-3 sts to avoid large loops on the back of your work. Monica will be available to answer questions and offer more advice on Monday 10th November, 3-4 pm, so you if have any questions for her, simply comment at the bottom of this blog and she will reply then. I will also be here for the rest of the time to answer any burning questions! 3. Click on ‘post comment‘ to submit it. We’d love to see how your project is coming to life so go ahead and share your progress with us and the rest of the lovely KAL knitters. You can also follow my progress and upload your projects on Twitter, mentioning @loveknittingcom and using hashtag #LKKAL. Click the button below to find us. This pattern is made by knitwear designer and teacher Monica Russel of The KnitKnacks. Last updated: November 7th, 2014. Great to hear! Let us know how you get on. How annoying! Have you printed it out yet? Hope so! Just printed off first part of pattern and am keen to start knitting. This jumper is for my 10th (yes tenth!!) grandchild for Christmas. Wow! I bet your a busy grandmother then! Have you started knitting? Can’t wait to get started! I’ll be making one for a 12 months’ old baby, but not sure whose baby yet. There is a whole new generation of babies showing up in our family, as my nieces and nephews reach their late 20s and early 30s. Some lucky baby will get to wear it, I’m sure! Omg I’ve not yet shopped for yarn! You can see everything you need here: http://blog.loveknitting.com/christmas-knit-a-long-an-introduction-to-materials/. Are you based in the UK? I’m waiting for my supplies still to come! Hopefully any day. I can’t wait to start! My daughter is having her first child, my first grandchild early december. I’m making the sweater for Christmas pictures! They live in Florida so I’m not sure if it will get worn beyond that. I’m knitting with the Bamboo blend. Come on postman! Congratulations on your first grandchild. What a lucky baby, they’ll be! Hope you get your supplies soon so you can get started. I’ve started and so excited!!! But, how do I join in yarn B? Thanks, just a beginner knitter!! I’ve started and am so excited!!! How do I join in yarn B? I’m just a beginner. Thanks. Just printed off the pattern and will be starting my tension square now! I’ve never followed a pattern chart before so am feeling a bit apprehensive. You might find this a little bit challenging if it is your first time reading a chart, but don’t worry as we are here to help if you have any troubles! So do let us know if you need any help. HA HA! It sounds like everyone else is just as excited as I am! 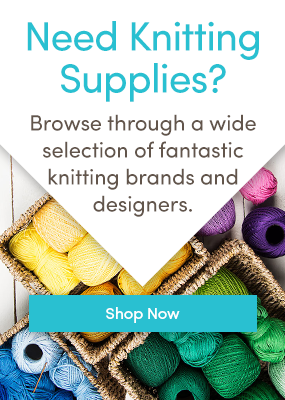 We’re so excited here at LoveKnitting! Can’t wait to see everyone’s projects come to life. Question what other kind of cast on is there other than the long tail and the simple loop and the back loop It says to knit in the back of sts if using traditional cast on or backward loop I don’t know what traditional is unless it is just looping the yarn onto the needle. What type of cast on does the pattern want you to do so that you don’t have to knit in back of stitches. There are lots of different cast-ons, for example: thumb method, knitted cast-on and cable cast-on. But try not to worry to much about the method, if you feel more comfortable casting on the way you normally do then that’s fine. It is just there as a guide. May I ask if a jumper is really a sweater? I want to make this for a new little boy. Yes you’re right, jumper is the same thing as a sweater. Looking great! Lovely colour choice too. Yes it would definitely be better to print it landscape across an A4 so that you can see more clearly. Look forward to seeing your next bit of progress! Thanks for sharing your progress. It’s looking very neat so far! Good luck with the enlarged chart. Itching to start this but I have a few Christmas projects I must finish first. I shall download everything ready to get started! Hope you get those Christmas projects done soon so you can join us 🙂 Good idea to get everything downloaded, but if you need to come back to the comments/advice, the blog posts will be here for you. I don’t get the video of knitting two socks on one circular needle that is suppose to show us how to knit two sleeves at the same time. Tried looking at other magic loop videos and still confused. Wish it was clearer. i’m so excited, i’m knitting 2 versions! couldn’t decide which colour! don’t who they’re for yet, can’t wait to get started. Why not! Which colours are you going for? Sounds lovely Susan, look forward to seeing your pictures! Very excited about starting the project! A quick question re the chart and number of stitches: the centre panel of the chart has 40 stitches with the 0-3 month size adding 2 stitches at each side making 44 in total. It says to cast on 45 stitches! Where do I work the extra stitch! Ah thank you for pointing this out to us! We had added an extra stitch to the pattern to make it even and forgot to change on the chart – We are updating now so I will let you as soon as its avialable but if you want to get going on the pattern now all you need to do is start one stitch earlier on your chosen size. Sorry for the trouble! We did a quick update of the pattern and the correct version is now available above by clicking on the download button. Thanks I did the long tail as that is what I am use to now but thought maybe England had something else. I too find chart to small and enlarged it and it is much easier to follow. I have done these charts before and now how to read them, Love the blue and white combo that she did. I think I will make one in a different color too for another baby in the family so they won’t be the same. Just to let you know, we noticed a minor error on the pattern as we need to add an extra column – in order to centralise the pattern we added a stitch making it an odd number to cast so that the point of the centre star would sit in the middle of the jumper. We will reissue the chart to take this into account, but in the mean time just start the star pattern one column earlier than is marked at the moment. We will have the new version up in the next hour. Sorry for this trouble! It’s updated now, so you can download again by clicking on the download button above! Well a finished my pattern last night and noticed the error when I was 1/2 through – ripped out and just added a column to the start. Hope it will look okay when I am done. Well done for noticing the error, we are very sorry about this and the chart is updated now, you can download the newest version above. I am sure it will look lovely! Assume the ‘9-12m’ size on the chart should be 6-12 months – as per the size range given on the sizing page of the pattern? FYI I did not like the other yarn I was using so I changed to Plymouth Yarn Encore DK due to worrying about allergic reaction to wool. It is in Cranberry and white It is a little darker red. Plymouth Yarns Encore DK is a great choice to keep you’re little ones scratch free and toasty! Hello knitters, well I have finished the back and now I am waiting for the front. I am making a white and teal sweater. Well done, Mai! You’re speeding through the pattern. I’d love to see a picture of you jumper so far as teal is one of my favourite colours! Sounds good, look forward to seeing some pics. This is my first attempt at following a chart and also a first for doing stranded work. I notice that I am pulling the white yarn too tight. I will try to loosen the tension on the front pattern. I am knitting the 6-12 month size and I am really enjoying this. The back of your jumper just looks great – I can’t believe it’s your first time at stranded knitting! My first attempt at following a chart and stranding wool, and I feel really pleased with how it’s turned out. I’m not sure the back is as neat as I’d like it to be but hope I can improve on this as I progress through the pattern. Am really enjoying my venture into new skill areas! Well done at your first attempt – it looks very professional to me! It can be tricky keeping the back nice and neat, but something which definitely improves with practice. Well done, it looks great! And although the ends are a little curly now, it’ll look just fine when blocked. Lovely colours! It’s looking just great so far. Who are you knitting it for? Stunning colours Susan! Is it just pinned or have you dampened or steamed it yet? Just pinned to measure and make sure my tension is ok, not usually that fussy but want it to be nice. Love the colours, its good to see a range rather than everyone doing the same. I’ve loads of purple dk in my stash (all the same) so I might do a second one in purple and white. I love the colour choice as well-look forward to seeing the next part. Never participated in a KAL before! Kinda enjoying the process! Question. Why is this called a jumper? I always thought a jumper was the little girls dress, ones with straps on the shoulders. Thanks and look forward to part 2!! Hi, Carole. As the American daughter of a British mother, I can answer your question. What we Americans call a sweater, the British call a jumper. Sorry, I do not know what the British term is for what we refer to as a jumper. Maybe someone else will know. That sounds more like a pinafore dress. You’re right, a jumper in the UK is the same as a sweater in the US. And what the US might call a jumper is actually a pinafore dress in the UK. It’s funny how things can get lost in translation, isn’t it!? Well, really do learn something new every day! Thanks all of you for the explanation! Oops, forgot to post my picture! Lovely colours, Carole! Who are you knitting this sweater for? The loves of my life….my grandchildren! Love your colours and it looks so tidy too! Looks gorgeous-love the original choice of colour. I agree in England the term for sweater is a jumper. Look forward to seeing more once the next part of the pattern is out. Thank you, Susan. I know my grandson will like it! Here’s my attempt. I havent done stranded work in over 25yrs and am a bit disappointed with the loose appearance of the white stitches. It’s knitted in Bamboo. The reverse is quite tidy though! Bamboo is always a bit more elastic than wool but I am sure the end result will be great. I love the blue and white. You selected my absolute favorite blue, too! The slight sheen of the bamboo looks great in this pattern. just thought I’d show the back as well…I’m impressed with my neatness here!!! wow you did way better than I did!!! My wool b was pulled to tight and my back looks terrible. But it’s my first one so I’m okay with that!! This time only though!! Your back is, indeed, tidy. How many stitches did you carry your yarn over? I stuck to two or three. It looks like you twisted after every stitch! Yes you are completely right, there was an error with the original chart which we amended on Friday – the new chart is available above in the download button. Well done for spotting and correcting and thank you for sharing your guidance with everyone! Am really loving the array of colour choices people are using…very inspiring! It really is great isn’t it! I have only been knitting for a couple of years and I taught myself, still learning how to read and understand patterns so even though I have made one or two mistakes I’m quite happy with this. I am a slow knitter but I think I’ve learnt enough doing the back I hope the front will be far better and done a little quicker. This looks brilliant! Well done on making such great progress, look forward to seeing the front part! I love the idea of the white stripe. Well done. Great now the people who have finished the back has to start all over again is that what this means! We are very sorry about this and know what a pain it is, we tried to let everyone know as quickly as possible last week. We hope now that the chart is corrected, you will continue to enjoy knitting it. Hi, Thanks for this KAL…this is my first attempt on intrasia and also , first KAL. I have completed the pattern part, now trying finish the back.When we will have pattern for first part or, we have to knit like the back part? Thanks for the information and help. The back part above is the first part of the pattern, we will be revealing the next part of the pattern on Thursday 13th November. I don’t understand what happened people saying there was a mistake I am doing 3/6 months and on my download it said 49 stitches, so is that wrong do I have to make it 50 stitches. I know this is the first time doing one of these but mine seems to look fine. I have done this wrong do I have to rip out and start again. If you have cast-on 49 stitches for 3/6 months this is correct. There was a mistake on the chart last week where we had to add an extra stitch in, if you have downloaded the newest chart (you can find the download in the button above) then everything is fine. If everything looks ok then it sounds like you have done it correctly and no need to rip it out. I’ve adapted the pattern to fit a larger size 1-2 years. I photocopied and enlarged the pattern and played about with it to fit the number of stitches I need. Looks lovely Elvine! Great work! I also am making a larger one. Instead of adding stitches, I used larger needles: 5 and 7. I added two rows to the bottom band, a couple of rows below and above the Fair Isle section, and a third rib in the garter band, which you elected to forego. After the pattern section, I measured the bottom band and then did a little proportional algebra to calculate the length the section should be. Hello to fellow knitters from Australia. I am a little behind the rest of you as my wool arrived on Monday. I am looking forward to everyone’s progress and it looks as though you are all doing really well. I don’t have any babies to pass this on to but my youngest son is getting married to a lovely girl in January. I will save my jumper for my first grandchild. I have knitted the 6 to 12 month size in ‘Sublime’. What beautiful yarn and will be lovely against sensitive skin. Whilst you are knitting for Christmas it is too hot here for a jumper, so it will be worn in our winter. This looks amazing Kerry! And what a good idea to save it for future. Look forward to seeing your next bit of progress. I am enjoying reading the comments and impressed by everyone’s knitting. After several false starts I have now completed the back but am waiting for grandaughter to come at the weekend to try for size as I have had difficulty obtaining the width in the pattern. I did a tension square and changed the needles to 7 and 9, but still had to knit the biggest size to obtain the required width for 6-12 months. The length of the largest size might be too much so will have to adapt the pattern. Not sure what is going wrong. Looking at part 2 do the rows of garter stitch on the back come at the underarm? Help please. Well, done with the front! Really like working on this this! May have to start another one while I wait for next week’s installation! Thought I would share a picture of the back. I like carrying the yarn ever two stitches. Makes for a better tension for me. Hi there, I’m hoping to start this weekend, but want to double- check something before I do. At the end of this section the pattern says cast off stitches. Is that all of them or do we leave some on a stitch holder for the neck band? Apologies if I’m just reading past it – wouldn’t be the first time! You can cast off all, or as you suggested you can also leave some (9 sts) on a stitch holder. Either way is fine, it’s probably easier to leave in a stitch holder so that you won’t have to pick up later, and that’s actually what I did! I found the way that the pattern says to do the neck edge casting off is not as clear as I am use to it took me several times reading it to understand it usually it says knit/purl to certain spot and decrease/cast off so many. Just an observation. I guess I am being picky but not being an experienced knitter found it confusing. Thank you for your comments, it’s good to get your feedback so that we can make improvements for the future. We want all our knitters to understand so perhaps this was written too much with advanced knitters in mind. Your front part looks great! We know we have taken down the pattern to check over, but the issues are only for the larger sizes so are no problems with the smaller size. If this is your first time stranding, then it’s perfectly natural that your tension is a bit tight and this will be something you will get used to over time. Please do let me know if you need any other advice or help, the pattern should be updated today and the next part will be posted on Thursday. finished front after taking it out 5 times due to tension too tight in back. It did not come out as I had hoped but it is finished. Have to learn to block next. Well done! The bright red really is a lovely colour, good luck with the front and let us know how you get on. Where can I find part 2? has it been published yet? Hi all. I’m sitting here happily knitting away and was wondering if any of you are knitting this in green. If anyone is what shade are you using. Some people are knitting it in a lime green I have seen, I haven’t seen any Christmas green yet! What shade are you knitting in?